Norman Cunliffe, Antony Difford & Ted Lightbown. Softback A4 size: 100+ pages. Published by Blackpool and Fylde Historical Society. 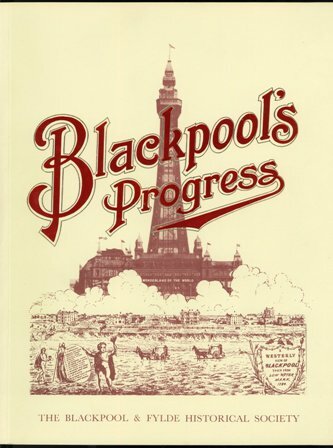 BLACKPOOL'S Progress' was first published in 1926 by the Corporation's Library and Art Gallery Committee as part of the celebrations for the jubilee of the town's incorporation in 1876. It utilized illustrations brought together for an exhibition in the Art Gallery, many of' which were subsequently dispersed and have not 'surfaced' since then. This edition has been produced from a copy of the original book. However, nearly all the portraits of mayors and officials have been omitted (plates 3-10 and 12-45 in the original). Also plate 58 (corresponding to 100 in the original) has been produced from a good photograph, kindly supplied by W. John Smith, instead of the retouched newspaper print previously used. The order of the illustrations is not ideal but it has not been changed for technical reasons. The brief captions of the 1926 edition contain many poor estimations of the dates of photographs. Also, as many of the subjects were still within living memory in 1926, some knowledge of them appears to have been assumed. Therefore, new captions have been prepared which, hopefully, will help readers to relate the views to modern Blackpool.